I am at the hospital with this cutie…she is my 94 yr old Aunt Pearl. She’s not doing well. If you pray, please pray for her to feel the comfort and peace of God right now. This photo was taken 3 weeks ago at our family reunion. 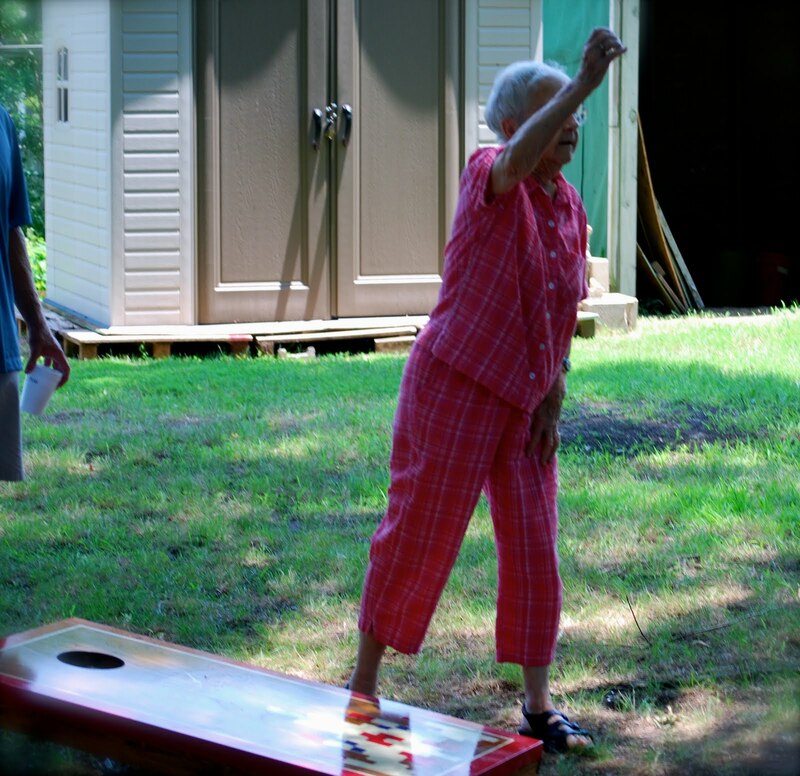 She was playing a little corn hole. Ain’t she cute? Aunt Pearl, even her name is sweet! I wish her all the comfort she needs and deserves right now. And for you also! I prayed for he and your family! Prayers being sent up for both Aunt Pearl and your family! prayers for Aunt Pearl. She and my great aunt Sarah, who is 98, would be the best of friends. Oh, I hope everything turns out for the best for all of you. My prayers are with you all. blessings to your antie. and to you! Awww, Love and Prayers to Aunt Pearl! I will say a prayer for her, hope she feels better! May the Peace of Christ be with this entire family, Lord, especially Aunt Pearl. YES, she's adorable. So sad that three weeks ago she was doing this good…or maybe that is a blessing. Either way, just said a prayer for her. Yes, she's adorable. I love older women and would often much rather be around them than my own generation. We'll keep your Aunt Pearl in our prayers.